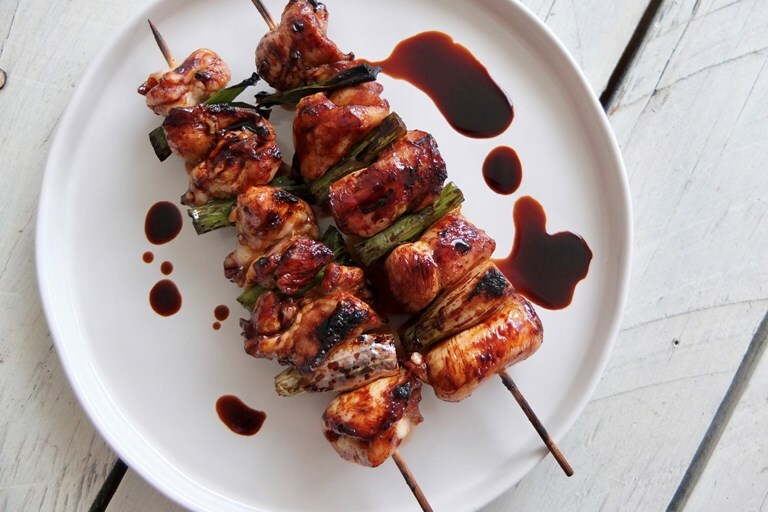 This irresistible chicken yakitori recipe is a simple, delicious way to barbecue chicken, combining sweet, sticky tare glaze and hot charcoal to great effect. Remember to keep your chicken and spring onion bites the same size for even cooking, and don't forget to soak your skewers to stop them burning! Yakitori is the quintessential Japanese barbecue dish, in which chickens are meticulously butchered into their component parts and precisely arranged in different ways on small bamboo, wood or steel skewers. The chicken must be grilled over charcoal (even a specialist type of charcoal called Binchōtan is used) and it is usually served with a ‘tare’ or soy basting sauce, into which the meat is also dipped as it is being cooked. A yakitori chef is highly respected in Japan (the Japanese do an excellent job of becoming highly specialised in the kitchen) but it’s okay, you can have a go at home with very pleasing results. It’s worth butchering the chicken yourself because you get to try all the different cuts, and pretend you’re a yakitori master at the same time. However, chicken thighs and breasts are easier and faster.